"Splitting Of The Sea" is a limited edition micrograph. One of only 500 prints. Numbered and signed by the artist, Manachem, in Hebrew cursive script. The micrograph contains the whole text of the Shema or book of Exodus. This micrograph by Manachem was substituted for another work by the artist BOAZ. It is assumed that this substitute micrograph may have been stolen. Please assit in finding the rightful owner of this work of art. If you have information regarding a missing work similar to the one pictured here please message TOV Research or call 347-535-0890. If you have seen this micrograph before please report where it was seen. There is a $500 reward for information that results in finding the rightful owner of this work of art. Please share this page to assist in the return of this micrograph to the rightful owner and help stop thefts from disabled veterans and senior citizens. Help find the rightful owner of this art and receive a $500 Reward. 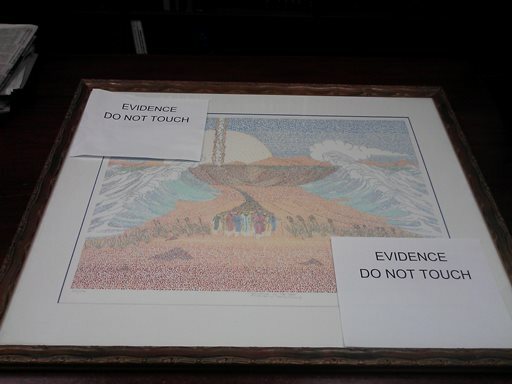 Additional Reward of $2,500 if Boaz micrograph is recovered as a result of your tip.